Chiloe, one of the most emblematic places for tourism in Southern Chile, this Province is part of the Tenth Region of Los Lagos, formed by the main island called "Isla Grande de Chiloe" and countless smaller islands. Fishing, agriculture and livestock are the main activities, however the wealth of landscapes inserted in an unique geographic setting, its rich folklore and mythology along with its exquisite cuisine based on the abundance of seafood and livestock make tourism an activity that expands every day. The population of the archipelago reaches approximately 170,000 people, the capital is Castro, other important towns are Ancud (the former capital), Quellon, Dalcahue, Chonchi, Achao, Queilen, Quemchi, Cucao. The climate ranges from temperate-cold to temperate-rainy, with abundant rainfall which varies from 1300 mm. to 2300 mm. per year depending on factors such as height. The arrival to the island so far is usually via ferry sailing from Puerto Montt through Canal de Chacao (Chacao Channel), for the next years is projected the construction of the largest suspension bridge in South America, which will link the island to mainland Chile. The mythology of the islands is very rich, among the most widespread stories is the legend of "El Caleuche", a ghost ship that appears only at night and sails the seas of Chiloe, crewed by very powerful warlocks and in the very dark nights it glows brightly because it sails fully illuminated, it also has the ability to navigate underwater. The melodies and dances of the big parties that take place on board attract the sailors of nearby ships who join El Caleuche's crew. Another task of the ghost ship is to pick up those who have died drowned. Also a common legend is that of "El Trauco", a deformed man, his body resembles a tree trunk, very short, inhabits the forests of the region, using a cone-shaped hat, carrying a small wooden baton or ax, is a very strong man of very lustful instincts. Another mythological character is "La Pincoya", a young woman of great beauty, she has an entirely human aspect, of long, blonde hair and represents the temperament of seas and beaches. It is said that she appears from the depths of the sea half naked, wearing only some seaweed. When a shipwreck occurs, she appears to give relief and when she dances facing the sea means that fish and seafood abound, but if she dances with her face toward the beach, suggests that fish and shellfish are scarce. There are also many other characters that enrich the abundant mythology of Chiloe like "El Camahueto", "El Imbunche", "El Chivato de la Cueva", "La Fiura", "El Basilisco", etc., each with a story that is passed from generation to generation. 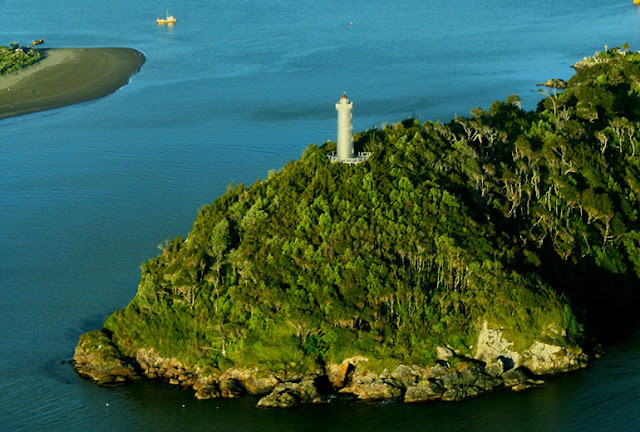 Chiloe Island is a great tourist attraction and Chacao is usually the starting point of the route. Located on the North end of the main island, this village is the first place you see when arriving by ferry from Puerto Montt after a crossing that takes about 35 minutes. 27 Km. W. of Chacao, until 1982 the capital of the Province of Chiloe, with a little more than 40,000 inhabitants. It had great strategic importance to the Spanish crown during the colonial period, until the island was annexed by Chile in 1826 after the War of the Independence. In Colonial times, Spain had built a system of strongholds such as Fuerte San Antonio, built between 1778 and 1779, with cannons pointing towards the sea dominating the harbour entrance. Located 800 meters from the current Plaza de Armas (Main Square), today the fort is a park where you can stroll among the ancient bronze cannons. Despite the rather humble origin of its population, Ancud had also great prestige in the area of education since up to 1973 it was home of the "Escuela Normal Rural de Ancud", formation center for Primary School Teachers for all the South of the country and which trained several generations of distinguished professors. Other places to visit in Ancud include the Feria Municipal y Artesanal, located in Prat St., where you can buy handicrafts and all the typical products of the island, coming from the countryside and fishing area, also traditional homemade liquors. Mercado Municipal de Ancud, located in Dieciocho St., constructed of native woods, with numerous stalls where you can buy handicrafts and taste the cuisine of the archipelago, mostly based on seafood and especially the "Curanto", a yummy typical dish of Chiloe whose preparation contains shellfish like clams or "tacas", large mussels, barnacles and razor clams; meats like chicken, smoked pork, pork sausages, lamb, vegetables like cabbage leaves, onions, potatoes and some dough called "milcaos" and "chapaleles". A very popular beach in Ancud is Balneario Arena Gruesa, at the end of Baquedano Street, where are also held culinary and folkloric festivals, live performances of artists and summer activities. Another beautiful beach is Playa Lechagua, located 4 km. from the downtown, covering part of the Gulf of Quetalmahue. Also a point of interest is Mirador Cerro Huaihuen (Cerro Huaihuen Lookout), located 3 Km. NE of the Plaza de Ancud, allowing a panoramic view of the city, facing the Chacao Channel, with the islet of Cochinos and in the distance the continent with its beaches, cliffs and Carelmapu Cove. Continuing eastward there is a second viewpoint, where you will see other beautiful places like the roadstead of Pudeto river, its bridges, fishing and yacht port. Pinguineras de Puñihuil (Puñihuil Penguin Colony), declared a Natural Monument in 1999, located about 25 Km. of Ancud, you can access the site through guided navigations between the months of September and March every year. Three islets which concentrate a rich marine and bird fauna, what stands out most is the presence of Magellanic and Humboldt Penguins. On the Lacuy Peninsula, 26 km. 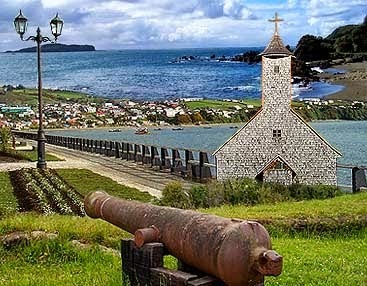 of Ancud is situated Fuerte Agui, whose construction dates back to 1779, considered as one of the last strongholds of the Spanish Monarchy in Latin America. Museo de Ancud (Museum of Ancud), located just opposite the Plaza de Armas, its edification is the replica of 6 Spanish towers with a central space, featuring a permanent exhibition that spans over 6,000 years of regional history and culture, even including a review of how the 1960 earthquake was lived, the most powerful ever recorded, all presented in several halls and 2 open courtyards, in one of them there is a replica of the schooner Ancud, that weighed anchor from Chiloe in 1843 to take possession of the Strait of Magellan. Capital of the Province of Chiloé, Region de Los Lagos (Region of Lakes), located 1214 km. south of Santiago, on the East coast of the Isla Grande de Chiloe. The population, according to the 2012 census was of 43,460 people. The third oldest city in Chile, founded in 1567, has a beautiful typical architecture and an impressive natural beauty in its surroundings. Among the major urban attractions in Castro are the Palafitos, picturesque houses located on the banks of the Gamboa River and Canal Lemuy. The Palafitos are built on long stilts mounted on the seabed, when the Ocean rises, the houses seem to float. 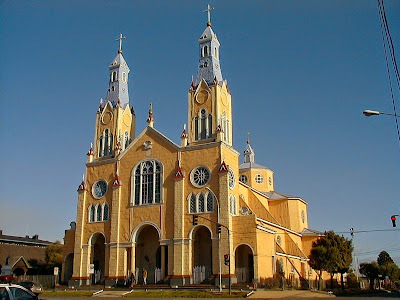 San Francisco Church (Iglesia de San Francisco), National Monument since 1976 and World Heritage Site since 2000. The main Catholic Temple of Chiloe is located next to the Plaza de Armas (Main Square) of Castro, highlighting the height of its towers of 42 meters, its colors and everything inside. Founded by the Jesuits in 1567, it was adopted by the Franciscans when the Jesuits were expelled from the Spanish Empire in 1767. The current structure is from 1906, designed by the Italian Eduardo Provasoli, and built by local carpenters. Another must-see place to visit in the capital of Chiloe is the Museo de Arte Moderno or MAM Chiloe, created in 1989, a gallery and cultural center dedicated to Contemporary Art. The design of the structure has earned important awards as it combines the traditional local architecture with new lines. It is located in the Municipal Park of Castro, about 4 km. from the downtown. During the low season (April to October) it stays closed. Something that characterizes the Island are the typical Churches (Iglesias de Chiloe), 16 of them considered a National Historic Monument and from 2000 World Heritage Sites for the UNESCO. These constructions are very resistant to moisture caused by continuous rains, made of native wood and shingles. Its style is the result of the fusion of ideas inspired by old European Churches adapted to the technique of the carpenters of the island and the means which were available at that time, as of the 18th. century, although there is evidence of the presence of some of them in documents dating from the early 17th. century. Some of the existing churches are from that period, in some cases is the reconstruction or remodeling of the original one, collapsed either by fires or natural disasters such as earthquakes. The most representative Catholic Temples of about 60 existing on the island are: Jesus Nazareno de Caguach, in Caguach Island; Santa Maria de Loreto, in Achao; Nuestra Señora de Gracia de Villa Quinchao, in Quinchao Island; Nuestra Señora de Gracia, in Nercon; Nuestra Señora del Rosario, in Chelin Island; Jesus Nazareno de Aldachildo, in Lemuy Island; Natividad de Maria de Ichuac, in Lemuy Island; Nuestra Señora del Rosario, in Chochi; San Antonio de Colo, in Quemchi; San Francisco de Castro, in Castro; Santa Maria, in Rilan; Santiago Apostol, in Detif; Nuestra Señora del Patrocinio, in Tenaun; San Juan Bautista, in San Juan; Nuestra Señora de los Dolores, in Dalcahue; San Antonio de Vilupulli, in Vilupulli. The evangelization of Chiloe began to gather strenght in the early 17th. century when the Jesuit Order established a system of itinerant Missions that went over the island and after the expulsion of the Jesuits from America, the Franciscan Order continued the evangelization work. One feature that draws the attention in the architecture of Chiloe, especially in Castro, is the presence of the Palafitos, a special type of houses mounted on luma wood stilts that are at the seashore. At first, the Palafitos were houses built by the fishermen who wanted to live near the shore to fish when the tide went out, and although the years have passed, the dwellings are still standing keeping their structures, even today some of them have evolved into shops, hotels or restaurants. Year after year these buildings attract thousands of tourists, and were considered by the English newspaper "The Telegraph" as one of the must-see tourist attractions in Chile. 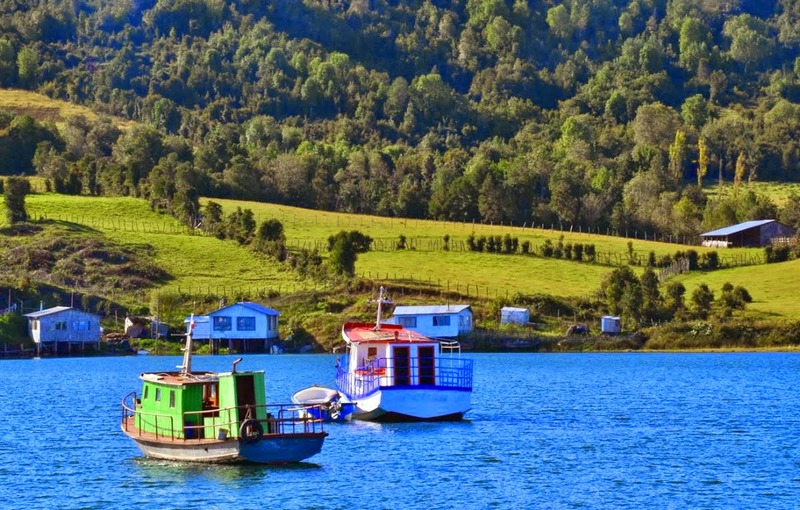 Located on the East coast of the "Isla Grande de Chiloe", famous for its gentle landscapes and for being the birthplace of the famous novelist of the 20th century and Chilean National Prize for Literature, Francisco Coloane. Coloane called this locality "La Tierra de los Mil Paisajes" (The Land of a Thousand Landscapes). The population of the commune nowadays reaches approximately 20,000 inhabitants, dedicated mainly to fishing and agriculture. 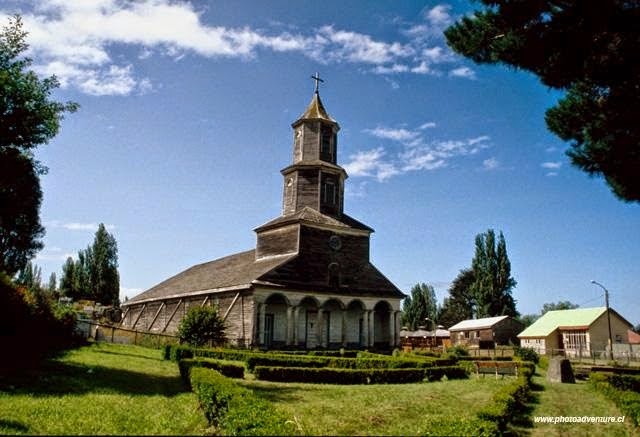 Among the attractions of Quemchi can be highlighted: the Church of the village of "Colo", declared a National Monument and a World Heritage Site, at the side of the school; Quicavi, a small village surrounded by beautiful beaches which has been recognized as a land of sorcerers, abundant in the mythology of Chiloe; the smal lake Lago Popetan, one of the most beautiful landscapes of the area, 8 km. of Quemchi, suitable for sport fishing and water sports, as well as many other interesting places. Lemuy, located 36 km. South of the city of Castro, is the third largest and one of the most important islands of the Chiloe Archipelago, standing out for its 3 churches declared World Heritage Sites: Ichuac, Aldachildo and Detif, and for the spectacular natural landscapes which can be enjoyed from several overlooks. The main lodges are in the central forests, where there are different activities of hiking, trekking and from its quiet beaches boat rides to the surrounding islands. The main town of Lemuy is Puqueldon, of 5,000 inhabitants founded in 1885. The precise date of foundation is unknown, in 1567 Spanish colonists settled down in the area. As in most of Chiloe Island, tourism is one of the main activities. The commune, located 20 km to the NE of Castro, the provincial capital, has an area of 1239 square km and a population of almost 13000 inhabitants. Among the tourist attractions is the Shipyard for wooden fishing boats, for which the carpenters of the island have their own construction techniques. 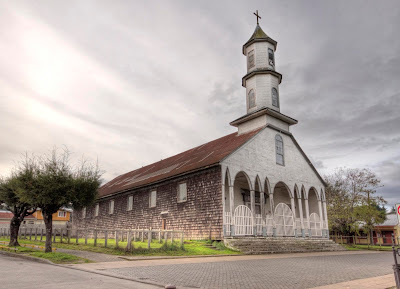 The Iglesia de Nuestra Señora de los Dolores (or simply Church of Dalcahue), located in front of the Main Square, being one of the 16 Temples of Chiloe recognized as World Heritage by the UNESCO the year 2000. Built between 1893 and 1902, it is considered one of the oldest churches existing on the island today. The Museo Historico- Etnografico- Antropologico (Historical Anthropological Ethnographic Museum), in 105 Pedro Montt St. a palafito house (house on stilts) that keeps collections of the native Chonos and Huilliches peoples. Created in 1982, with 43,057 hectares, Chiloe National Park is located on the West coast of the Isla Grande de Chiloe (Greater Island of Chiloe). It has two main sectors which are Chepu in the commune of Ancud and Abtao, part of the communes of Castro, Chonchi and Dalcahue. The major attractions of the park are concentrated in the indigenous locality of Chanquin, near Cucao Lake where the coastal dunes are several kilometers long; the mouth of Abtao River, a beautiful landscape and very rich from the point of view of the biodiversity; the small rocky islet of Metalqui with its colony of Sea Lions; Huelde Lake, easily accessible because it is connected to a path; Cole-Cole, an area adjacent to Chiloe National Park which initially was part of the protected area, however sections of the park were given to indigenous communities. Cole Cole has a beach suitable for fishing, hiking and horseback riding. Tantauco is a private Natural Park open to the public, located South of the "Isla Grande de Chiloe", 110 kilometers from the city of Castro and 1,200 km South of Santiago. The name Tantauco belongs to the Huilliche language and means "place where the waters meet", it is also the name given to the peace agreement signed in 1826 between Chile and Spain by which the Chiloe Archipelago joined the Chilean territory. Within its 118,000 hectares are found ancient evergreen forests, large lakes, rivers and peat bogs dating from the last ice age. But its creation in 2006 was not without controversy because there was a widespread rejection of local ethnic communities, the "Huilliches", who claimed ancestral rights over the territory. Today, Tantauco is a non-profit nature conservation project, administered by Fundacion Futuro, open to local, national and international community all year round, allowing the park entrance at a low cost and flexibility according to the interests of visitors and time availability. Tantauco Natural Park is open all year round, access is possible by sea in the area of Inio at the Southern end of Chiloe and by land through the area covered by Yaldad and Chaiguaco lakes. Tantauco Park can be visited for one or more days staying at Inio or Chaiguata campsites, kayaking at the Chaiguata Lake or Inio River, trekking through its different paths, you can also practice sport fishing and whale watching in the zone of Caleta Zorra, visit archaeological sites in the area of Inio and watching wildlife throughout the park.